Background: Incidence of adenocarcinoma of esophago-gastric junction is increasing rapidly in India. Some of the lesions involve significant lengths of the lower esophagus and the stomach. 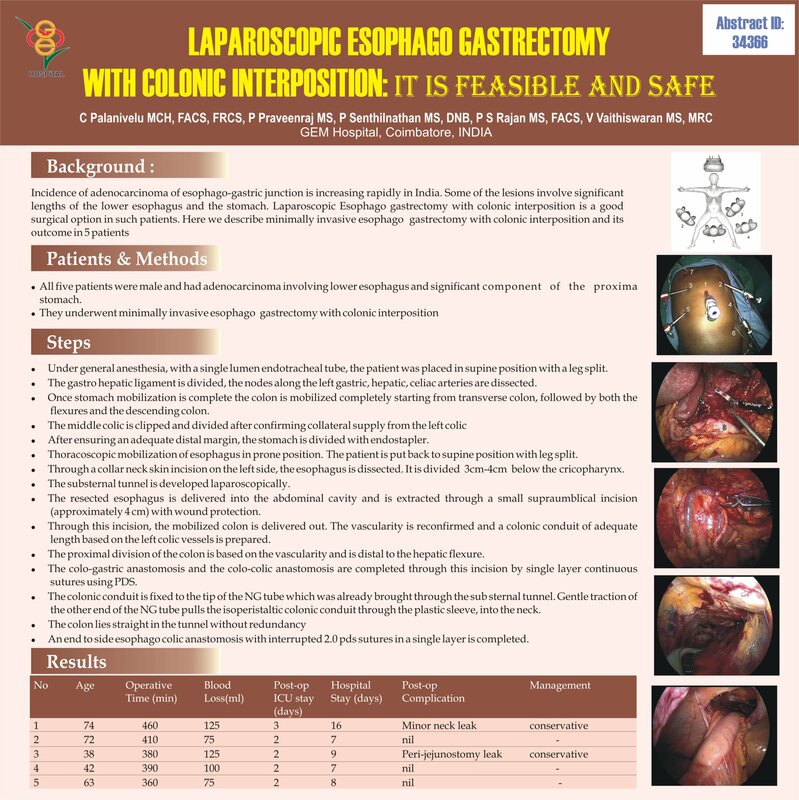 Laparoscopic Esophago gastrectomy with colonic interposition is a good surgical option in such patients. Methods: After routine imaging and work up patients were taken up for this procedure. Laparoscopic mobilization of stomach and clearance of hepatic, left gastric and celiac nodes was done followed by Laparoscopic mobilisation of the colon. Thoracoscopic mobilisation of the esophagus with removal of mediastinal nodes was performed in prone position. Mini laparotomy to extract the specimen was performed and the colonic conduit prepared and colo-gastric anastomosis completed. Laparoscopically the substernal tunnel was created and colonic conduit was delivered to the neck. Esophago gastric anastomosis was completed. Results: Eight patients were taken up for the procedure. The mean operating time was 424 min with mean blood loss of 150 ml. Median hospital stay was 11 days (10 – 22 days). One patient had leak in the neck and was managed conservatively. There was no mortality. Conclusion: Laparoscopic Esophago gastrectomy with Colonic interposition is feasible and safe.